14 Humans escape French Migrant Camp. 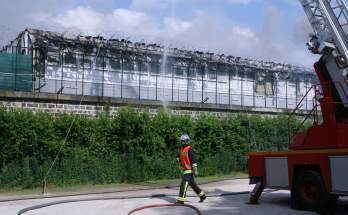 Fourteen non-EU nationals without visas or work permits escaped from a Paris immigrant detention centre after a fire that was deliberately set, police said Monday, revising earlier figures of 50 detainees. Following a fresh roll-call, police said of the 249 people held at the Vincennes centre at the time the fire broke out on Saturday, only 14 were missing and believed to have escaped. The detainees at France's biggest clandestine immigrant processing centre were transferred overnight to other centres in the French cities of Lille, Nimes, Palaiseau and Oissel. The police said the fire -- which destroyed the centre's two buildings -- had not caused any "serious injuries." Eighteen detainees were lightly injured and taken to hospital, and all were expected to be released on Monday, police said. Since mid-December, the site has been the focus of rising tension and protest with the French authorities having stepped up markedly over the past year the numbers of illegal immigrants it deports. Hunger strikes, fires, refusals to lock down for the night and scuffles with police have all cropped up at the Vincennes centre. On Saturday, a Tunisian died late afternoon at the centre, with Green Party lawmaker Noel Mamere calling Sunday for a parliamentary inquiry to be opened into conditions at the site. The blaze began when a number of detainees set mattresses on fire after the death on Saturday of a Tunisian immigrant detained in the centre. Police said he died from a heart attack while alone in his bedroom. "This one too many death is to be blamed on the obsessive, cruel, brutal and inhuman policy that criminalises immigration," the MRAP said in a statement. The French government has said it is aiming to expel 26,000 illegal immigrants in 2008 after missing its goal of 25,000 last year. States of Denial..........can things really be that bad for humans in captivity? The main French migrant group "9th collectif" has spent two days in extended meetings and assembly co-ordinating reaction to what occured at Vincennes in these last days and months. Surprisingly general acceptance of the conditions within the centre itself and detention camps in general is so low that one of the main questions being posed by the public is "Why would inmates risk their lives by setting fire to their mattresses at 15h45 on Sunday?" 50 fire fighting teams and 150 fire brigade personel went to the scene. 1 of their inmates had committed suicide by jumping through a window. 1 other had died of a heart attack alone in his cell in a camp where TASARs were used "to discipline"
180 are the days the EU allows for detention without trial. 273 humans were in the centre. 26,000 is approximately the expulsion target set by the French government of humans for 2008. For several months, prisoners, groups, families and elected representatives had been alerting the authorities to the scandalous situation in the detention camps. An accumulation of abuses of all types, tear gas, beatings, use of TASER arms. The anger, revolt and desperation led to the extreme protests : auto-mutilations, overdoses of tranquilizers, hunger striles. The destruction of the camp in Vincennes symbol of the industrialisation of arrest, detenion and expulsion creates a precedent which is important to take into account. The prisoners were gassed, then trapped by fire were moved to a gym. Some were urgently hospitalised for problems including breathing. The others were held in the yard surrounded by police who kept them during hours with hands on their heads, in the cold, fear, anxiety and state of shock.. They were not moved (and dispersed) till late in the night to various detention centres in Nimes, Lilles, Palaiseau, Rouen. This isn't an Airey Neave escape from the impregnable castle of Colditz boardgame which was the startling near success story of the now forgotten Mi9. They aren't whistling "colonel bogey" inside these camps. There is no bad boy Steve Mc Queen trying to screeching through that barbed wire on a motorbike to be brought back to the coal house and given his baseball and glove to play with himself another ten days alone. The humans in these centres are not subject to conventions of prisoners of war nor even afforded political prisoner status. Their home states and societies do not hold European prisoners as ransom or guarantee of good treatment according to the oldest rules of conflict engagement. Nobody threw themselves through a window in Colditz castle in desperation. Nobody in our prisoner movies and culture cut their ears, scarred their faces, sewed up their lips, moved to insanity pushed by inhumane and constant torture of psychological and physical type to near mystical disregard for personal safety. = Those humans who escaped have not been the first nor will the last. The week before some escaped from a camp in Oxfordshire England. = Those humans who burnt their mattresses and brought all the camp and its inmates together with guards close to burning - will not be the last. Until we stop denying how and why they are held. "this a precedent which demands to be taken into account"